In 1934, a year before his death, The German expressionistic sculptor, Ernst Barlach (1870-1938), made a special set of sculptures: The Frieze of the Listeners, nine sculptures of people who are listening. By listening they tap into a source that gives them new strength and leads them on their way through life. They do not roam about aimlessly, they are not to be subdued, as there is a higher voice that raises them above themselves. When we look at the elongated figure of the believer (2), the first thing that stands out are his hands which somewhat clumsily break out of the straitjacket of his cloak. Or do they pull themselves out of a protective covering? This man after all does not try to protect himself with his arms and hands as almost all of the others do, but is holding his hands vulnerably folded outwards. They lift out of his cloak like pitiful sticks. In this way Barlach seems to want to stress their powerlessness and weakness. They moreover look like they are loose and not attached to the man’s body, disconnected from all of his desires and longings. They surrender themselves and open themselves upwardly, receptive to whatever may be put into them. With his open, kind and beautiful face the man looks upwards. His countenance is relaxed and a smile plays around his lips. It is as if he is involved in an intimate conversation and looking full of trust into the eyes of a good friend. His eyes are attentively turned upwards, maybe even somewhat surprised. Is this because they are met by eyes that look down upon him filled with love? His hair and beard remind one of flames. The conversation has set him on fire again. Strengthened and fed by loving words he wants to share this love. The feet of the believer are ready to go into action. His hands extend in a blessing. 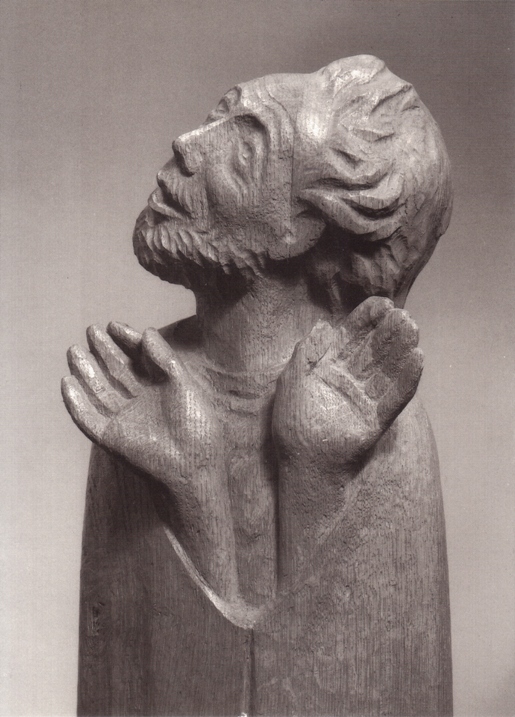 Ernst Barlach: ‘The Believer’, 1934, height 22 cm, part of The Frieze of the Listeners, 1930-1935, Barlach Museum, Hamburg, Germany.